﻿ Fountains Hotel Cape Town. JIMAT di Agoda.com! Ada soalan mengenai Fountains Hotel? Terletak di tengah-tengah Pusat Bandar Cape Town, Fountains Hotel merupakan tempat yang sesuai untuk meneroka Cape Town. Hanya 0.1 km dari pusat bandar, lokasi strategik hotel memastikan tetamu boleh ke mana-mana sahaja dengan cepat dan mudah ke tempat-tempat tarikan. Pelawat yang datang ke hotel boleh melawat tarikan utama di bandar ini seperti: Konsulat Uruguay, Konsulat Jeneral Rusia, Konsulat Britain. 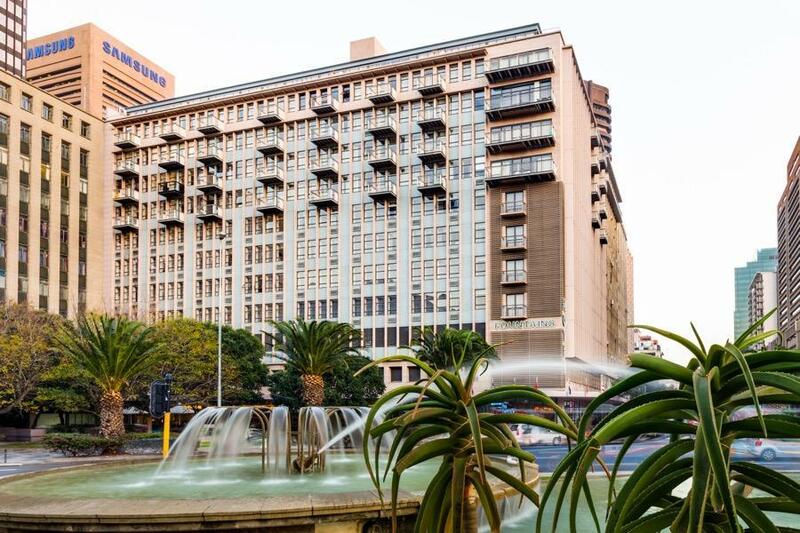 Fountains Hotel juga menawarkan banyak kemudahan untuk memperkayakan penginapan anda di Cape Town. Ketika menginap di hartanah yang indah ini, para tetamu boleh menikmati Wi-Fi percuma semua bilik, pengemasan harian, khidmat teksi, meja depan 24 jam, fasiliti tetamu kurang upaya. Suasana Fountains Hotel terpancar di dalam setiap bilik tetamu. ruang tamu asing, televisyen skrin rata, bilik larangan merokok, penyaman udara, pemanas hanyalah sebahagian daripada kemudahan yang boleh didapati di hotel tersebut. Sama ada anda peminat kecergasan atau hanya mencari cara untuk bersantai setelah seharian bekerja, anda akan dilayan oleh kemudahan rekreasi kelas tertinggi seperti pusat kecergasan, kolam renang terbuka. Fountains Hotel adalah destinasi sehenti anda bagi penginapan hotel berkualiti di Cape Town. room cleaning attempted too early! a good comfortable hotel. busy but efficient. nice limitless breakfast good location in centre of cape town for shopping and entertainment. free secure parking. small gym and indoor lap pool. wifi available with vouchers. comfortable room with good facilities. excellent staff. just small criticism of over eager cleaners and mini bar checkers wanting to get into the room at 8am on new year's day! The hotel is in the center and has a good location and breakfast is ok. Unfortunately, my air conditioning was very loud and did not cool. The vault was also first broken and was torn out in the closet. Also, I noticed negatively that the guest is not informed that the water is scarce and can be saved. I have seen better in other hotels. This hotel is older and dirtier than it looks. It's ok in reality but should have managed our expectations more. The room carpet doesn't seemed to be vacuumed and when we checked in our room, the toilet/bathroom hasn't been cleaned! We left after 1 day in this hotel as we also didn't like to stay in the city centre as there are a lot of beggars and scary people looking at us/approaching us. Firstly, it was very expensive. They’ve removed the swimming pool and none of the fountains were working I guess due to the water restrictions but we weren’t informed. They also charge extra for parking. It took 15min to try and sort out our check out since they weren’t sure whether we’ve paid or not, it didn’t show up on their system. But the staff was really friendly. I stayed here for a few days and it was a really good value hotel. The room had a separate bedroom and bathroom and the kitchen/living room was spacious and very well equipped. The hotel was in a very good location and I would recommend this to people in Cape Town on vacation or business. We stayed in this hotel for 2 nights.This hotel has a very good location as it locate in central of Cape Town.Very convenience to catch the train or bus.It's also easy to reach from CVC bus station ( Airport bus to town.Just take a little bit walk. Good breakfast.We can drink a lot of juice and can eat a lot of staff for breakfast. Room : is small but can sleep. Internet speed is very slow. 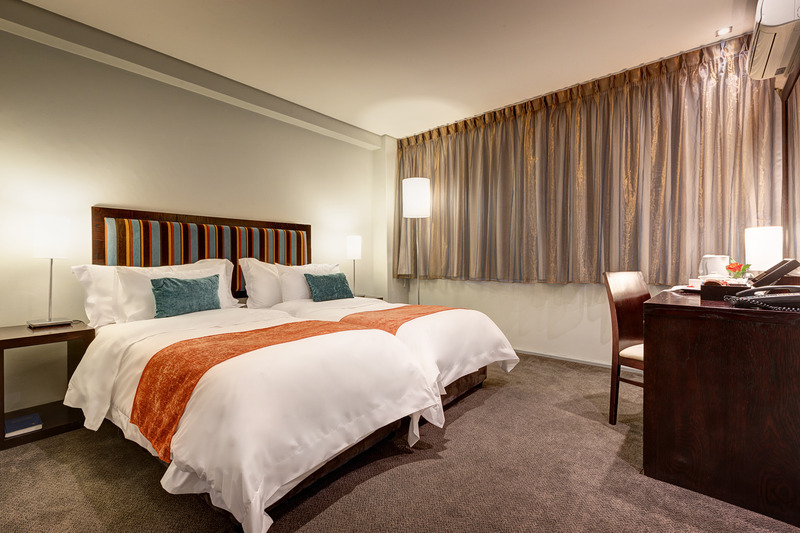 The hotel is 5 minutes walk from the airport shuttle, staff are very friendly with good buffet breakfasts good location for tour bus, taxied just outside, meals here are inexpensive with a good range to choose from. The hotel had a very large unruly party of Argentinian rugby players staying, slamming doors and generally being very noisy. I asked if anything could be done to give us a better night's sleep and they gave us a complimentary upgrade to a 2 bed, 2 bath suite with lounge, kitchen and balcony on the top floor! Fabulous! 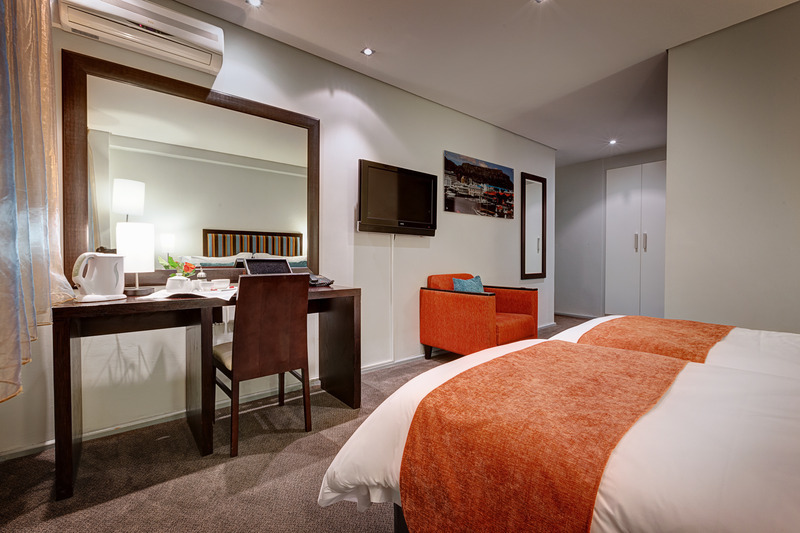 we had a very pleasant experience with our stay at hotel fountains at cape town. very near to waterfront and other happening places in city. rooms were excellent, well mainitained with a good view of the city. breakfast was great we well, with a lot of options and variety. Location, price, happy and friendly staff, great breakfast included. standard rooms are small but quite adequate and clean. extremely comnvenient location although tight manouvering for a hire car to get to the in house parking at the rear. surprisingly the hotel lacks a main street car access or presentation entrance which would be a huge advantage to it's operation. impressed with the friendly staff and willingness to assist at every opportunity. good sized bedrooms with lounge/dinner and kitchen. booked this hotel purely on price and that it seemed pretty central. i couldn't have gone wrong with it. local shops and eating places nearby, v & a waterfront only a 15 minute walk away, taxi took only a few minutes. secure parking within hotel building. staff very helpful, they even loaned me an electrical adapter for the week. will def stay here again if in cape town. I really enjoyed my visit at Cape town and the nice and serviceminded staff at the hotel. I really liked my stay at Fountain hotel. It was a nice hotek in bthe middle of Cape town. the best with the hotel was the nica staff. They did everything to make us pleased and always with a smile. The hotel´s atmosherevery was very kind and serviceminded. I will surely go back! Good breakfast, helpful hotel staff, reasonable internet cost. hotel room is abit small, very tiny indoor simming pool which can't be used. we chose this hotel based on clents' comment and luckily got a good deal from agoda. very satisifed with the service provided by the hotel staff during our stay. great location but our room was abit small. good breakfast and reasonable internet cost. easy to reach the hotel by taking airport shuttle to the citic center then walk 5 mins to the hotel. convenient location - right in the middle of the CBD. Great restaurant. Included breakfast was excellent. We enjoyed our stay in this hotel. The reception area is not impressive but staff is helpful. After arrival around mid-night and ordered for room sevice food. The food and service were excellent. Good value for money. Would recommend this hotel to anyone. Had an excellent experience. from front desk to the restaurant waiters everyone was exceptionally helpful and friendly. Location is excellent a lot is within walking distance. Over all excellent option. I stayed on a business travel for a week on a strict budget. The hotel delivered all that it promised and my stay there was not a problem at all. The location is good, and the staff friendly. The room was clean and wireless internet prices reasonable. My window faced inwards (towards the building) w/o a view, but i guess if you are willing to pay more, rooms with view are available... Overall a recommended hotel!